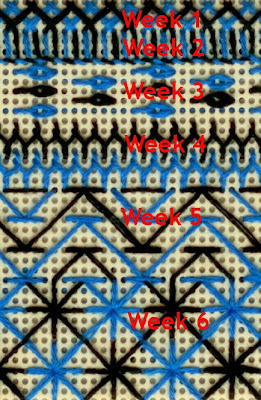 This is this week's TAST stitch, and my whole sampler is growing rather well. I think by the time this is all done I will have three, or maybe even four, of these to frame and hang on the wall. I am glad I choose only two colors for this one; it is neat to figure out how to make them play on each other to show differences in the stitches. This is looking really nice, all the stitches together. A sophisticated sampler! What a good idea and beautifully done. This sampler is growing really nicely! I love the bi-colour. What a marvelous border this would make.